When you hear the word sour, what do you think of? Does it conjure up negative associations or are you like me and a lover of all things sour tasting? Growing up, I liked to say that pickles were one of my main food groups and my love of sour flavours has only increased over time. This year, I’m predicting that sour will be the new hot. Rather than intense spices as a predominant flavour element, I think we’re going to see fermented and pickled foods in abundance on restaurant menus, and this is great news. Cabbage, salt and time. 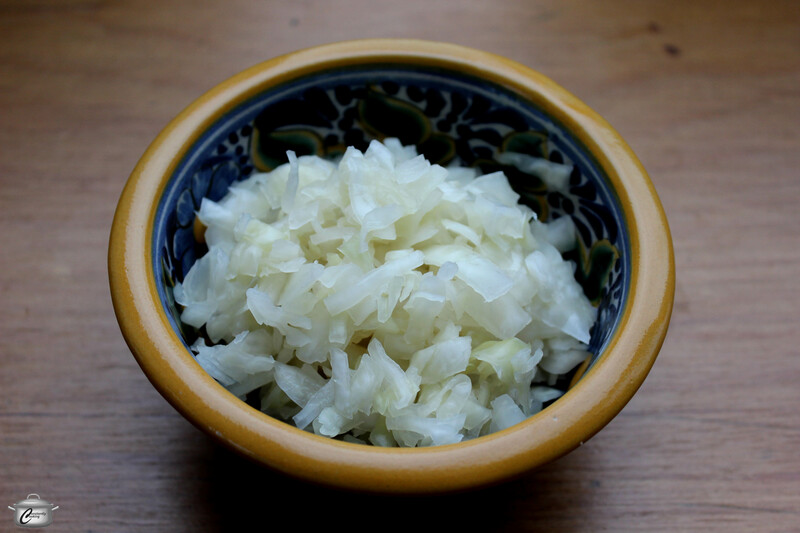 That’s all you need to make delicious sauerkraut – and fuel your body with a nutritious, lacto-fermented super food! The recipe is at the bottom of this post. Fermenting food is a tradition that goes back at least to the time of the ancient Romans, if not before; cheese, yogurt, wine, beer, kimchi, salami and coffee beans are just a few of the most popular fermented delicacies you might be familiar with. Pickling has similarly been a favoured food preservation method for millennia – some say it dates back over 5000 years – as well as a way of adding a burst of flavour to just about any plate. The best part? Both fermented and pickled foods are really, really good for you, delivering vitamins, minerals, antioxidants and tons of probiotic goodness to your gut. In addition to the sauerkraut recipe below, I’m looking forward to sharing more of my fermenting and pickling experiments with you throughout the year. 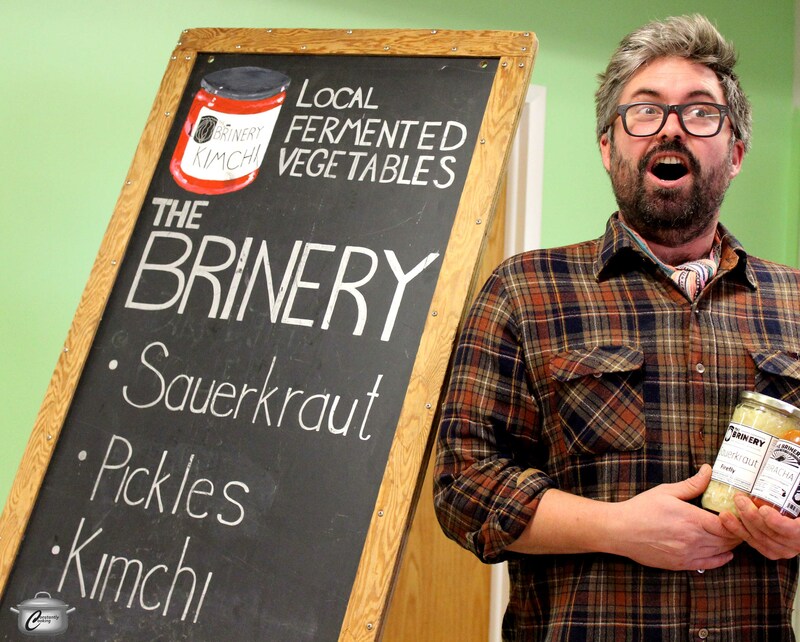 David Klingenberger, founder of The Brinery, is even more excited about fermented foods than I am. I got particularly excited about fermented foods after visiting a very neat spot last month called The Brinery, in Ann Arbor, Michigan. 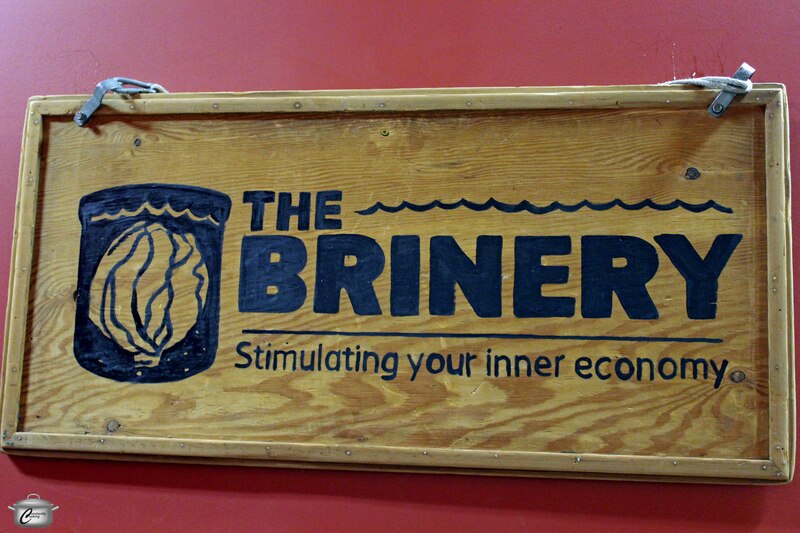 Named by Chef Mario Batali as his favourite thing about Michigan, The Brinery is part of this interesting region’s thriving, interconnected local food scene. Last year, proprietor David Klingenberger and his team transformed 200,000 pounds (that’s 100 tons or over 90,000 kilos) of local produce into all sorts of fermented yumminess. I was amazed to taste pickled vegetables that had a deliciously sour flavour but were made without vinegar – that’s the beauty of simple, time-honoured lacto-fermentation. Think this is just some wacky fad? David doesn’t – in just a few years he’s established an award-winning, half a million dollar a year business and is shipping product across the United States, with a tagline that reads ‘stimulating your inner economy’. From sauerkraut to pickles to sriracha and hot sauces, David and his team are creating some seriously delicious sour and spicy treats. 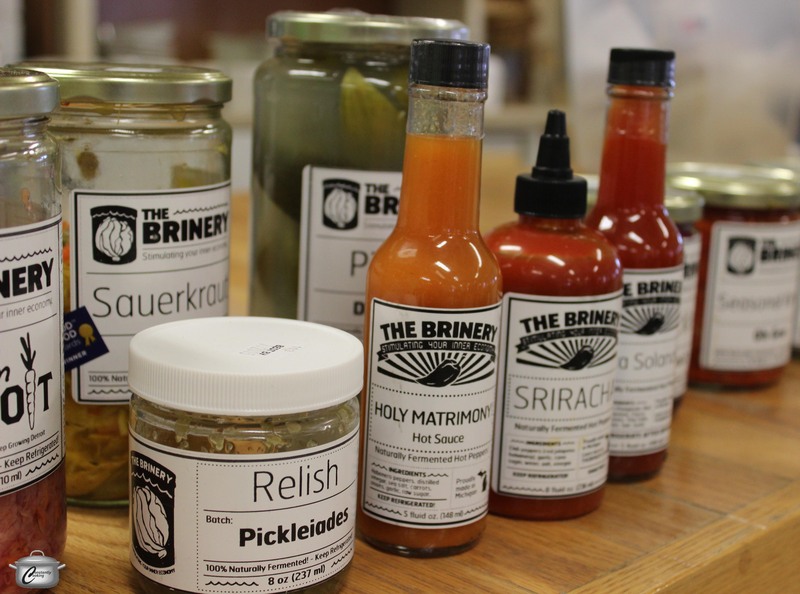 The Brinery’s ever-expanding product line is diverse and consistently delicious. I know because I sampled. A lot. “I am proud to take an ancient food tradition and make it relevant for modern times,” explains David. “We are using both classic and contemporary recipes, rooted in time-honoured methods.” The Brinery also wants to provide an economic boon to Michigan farmers. “We’re doing this by encouraging farmers to grow real food that will be carefully preserved for real people to eat rather than seeing acreage devoted to corn and soybeans which may be transformed into foods of dubious nutritional value,” he says. The Brinery’s clever tag line alludes to the many health benefits offered by eating fermented foods. So why is he championing lacto-fermentation? “We are actually composed of more bacterial cells than human cells,” says David. “Good bacteria are everywhere including on fruits and veggies along with yeasts, molds and more. The good news is that fermented foods are actually considered by the USDA as safer to eat than raw veggies because there are no known pathogens that exist in fermented foods.” So not only is lacto-fermented food safe, it’s also good for us, supplying the digestive tract with living cultures that are vital to breaking down food, absorbing nutrients and boosting the immune system. According to David, and many other proponents of fermented food, we need a healthy gut to have a healthy mind; better probiotic health means better digestion and better health overall. During our tour, David explained how easy it is to make authentic sauerkraut. It’s surprisingly easy and tates vastly different and more flavourful than the pasteurized stuff you find in grocery stores (see my recipe below, adapted for home kitchens). Try your hand at sauerkraut and you’ll also get to experience first-hand the joy of umami – that subtle, earthy ‘fifth taste’ (after sweet, sour, salty and bitter) which develops from the aging process. I recommend making a plain batch first to understand the method; on subsequent batches, consider adding carrots, garlic, dill seed, caraway or any other items that tickle your tastebuds! Peel off any damaged or dirty outer leaves of the cabbage and cut out the core. Finely shred the cabbage with a sharp knife or mandoline. For every pound (454 g) of shredded cabbage (it’s important to weigh it to get the proportions right), mix in 1 tablespoon (15 mL) of unrefined sea salt (2% of the cabbage’s weight in salt). Using a muddler or wooden spoon, pound the shredded, salted cabbage into your jars or other storage vessels about a half cup (125 mL) at a time. As you pound it down, it will soften and start to release moisture. Fill the jars to within two inches of the top. Add just enough filtered water to barely cover the cabbage with liquid (just a tablespoon or two should do it). Put a clean, food-grade plastic bag over the jar and press it down into the jar so it is covering the cabbage and brine. Put an elastic around the mouth of the jar to hold the bag in place. Take a second, smaller bag and fit it into the opening at the top of the jar. Fill it with enough water so it expands to completely fill the gap at the top of the jar and seal the bag. The water-filled bag will ensure that the cabbage will stay submerged in the brine so air cannot get into the fermenting mixture. 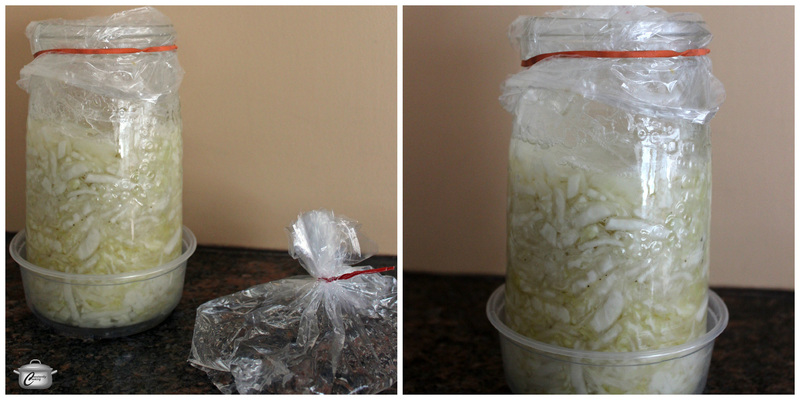 The photo on the left shows the jar of pounded cabbage covered with one plastic bag, along with the bag of water ready to top it off. On the right, the cabbage is busily fermeting in its airtight environment. It’s a good idea to begin in a 25C/80F environment to get fermentation going, then transfer to a slightly cooler environment to finish fermenting. I achieved this in December by putting my jars near a heating vent for a few hours each day during the first week. Let the cabbage ferment in the jars at 15 – 25C (60 – 80F) for at least two weeks; at that point you can start tasting it. Note that during the fermenting phase you will want to keep your jars in saucers (I used small plastic containers) as they will release moisture. Once the cabbage tastes sour enough for your liking (that might take up to six weeks), transfer the jars to the refrigerator. Replace the bags with a plastic storage lid (not a metal one – it will corrode) and they sauerkraut should keep for months. Consider downsizing the jar as you eat the sauerkraut. Try it on sausages, hotdogs, reuben sandwiches and even as a tangy topping for baked beans or chili! Disclaimer: On my recent culinary-focused trip to Ann Arbor, I was a guest of the Ann Arbor Area Convention and Visitors’ Bureau; opinions expressed are entirely my own. This entry was posted in Fruits and vegetables, Preserves and tagged 2015, Ann Arbor, antioxidant, brine, cabbage, fermentation, fermented, healthy, lacto-fermentation, Mario Batali, Michigan, pickled, pickles, probiotics, salt, sauerkraut, sour, tangy, The Brinery David Klingenberger, trends, vegan, vegetarian. Bookmark the permalink. 3 Responses to Pucker up: 2015 is looking deliciously sour! This is Wonderful news! Fermented foods are excellent for digestive health! They taste really great too! Pickled onions taste amazing on salads, sandwiches, pretty much everything! I love picked onions as well!